I can't quite make up my mind on whether or not I like this.. I think I was expecting something amazing because it'd been so hyped up. Keeping in mind that it's only about $3-4, it was really creamy for a cheap lipstick but I had to really layer it on to make it opaque. I found that it was more of a sheer lipstick which some people will like but I have fairly pigmented lips so sheer, light colours can look weird on me. You can see from the swatch that it's pretty sheer. This was about 3 or 4 layers of swatching. The lasting power isn't that great. It wears off immediately if I eat or drink but otherwise I've found that it lasted about 2 hours or so. It smells like.. gummy lollies. Kind of like, gummy bears or snakes? 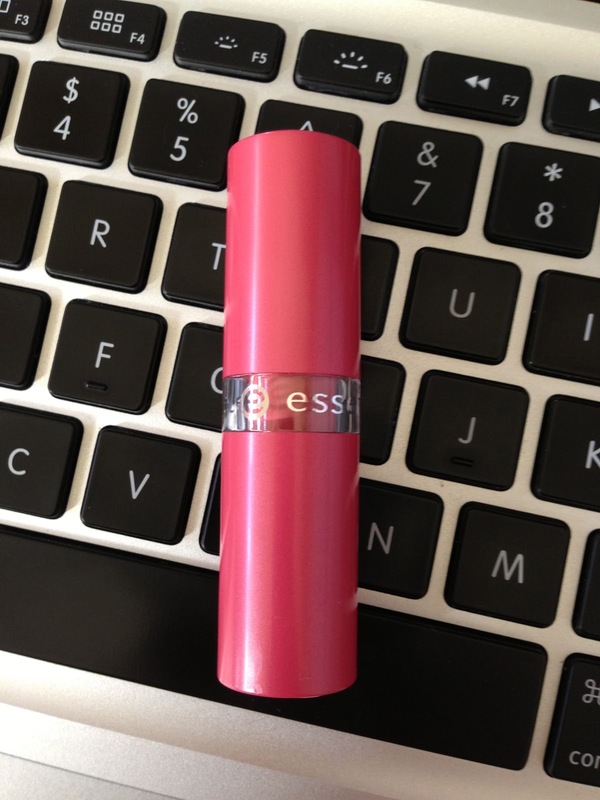 At the end of the day, it's a good lipstick and the bonus part is the price! I'm not too tempted to go buy the other Essence lipsticks (not a fan of the colours) but I think that this would be a good lipstick to get if you come across it... although it's not one that I would necessarily waste time and go hunting for. I like the colour of this one but then again, I have a lot of lipsticks that are similar. Love the price though! Yep.. I agree with you. I have a lot of lipsticks that are pretty similar in colour. Yep I know what you mean. I have never really been tempted by their lippies to be honest! People who don't understand to ask for testers really piss me off also! They don't have a big range and the fact that they have no seal on their products really put me off! I have to admit though, I must've looked silly inspecting each and every lipstick to make sure that it hadn't been swatched! Oh my goodness I have such a problem with the Essence stand and all their squished/mushed/smeared products. It is the most incredibly frustrating thing in the world, especially when you are searching for a popular limited edition product and you think you've finally found the one and then....someone has left some of their identity in the form of a fingerprint in your eyeshadow. Anyway, I personally really like this lipstick, but I like it for the reasons you don't (like that it is sheer). I love the cheap price, the packaging is a bit 'meh' but the shade for me is brilliant. 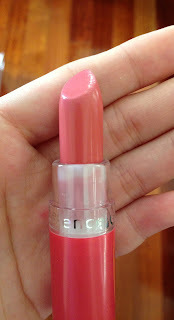 I actually got this lipstick after I read your review on it back in April! It's taken me this long to find it! 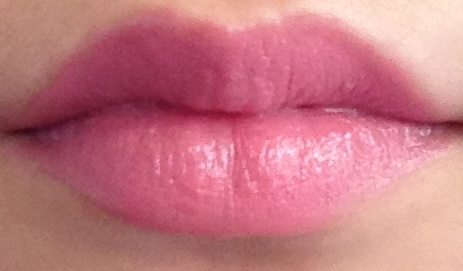 The colour is fantastic, but I feel that I have a couple lipsticks quite similar. All the essence stands I have seen have looked in pretty bad shape and I tend just to walk past them rather than deal with the chaos. 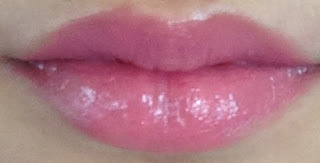 If you have pigmented lips.. you'll have to work harder for this to work for you.. you need to layer it on a lot! I've wanted to get this for a while but could never find it, and now I have a few similar colours so I don't feel it's necessary. I haven't tried Essence's lipsticks, nor do I have any urge to. I do have a few other Essence products which I think are great though. It's pretty cheap but like you said, you have similar colours so save your dollars for something else :) The new cherry blossom collection is out! You really got a nice lips :) And it suits you! but, still, will find the similar color from another brands with this one..
Yep you can definitely get this colour from another brand but you probably wouldn't get it for cheaper than this one! Secondly, gah at Essence! I love them but I hate that they don't seal their stuff! I don't understand why Priceline goes to the crazy amount of effort to seal their other products (thinking of the Lip Butters here...) and make excuses for it, but can't put a tiny bit of sticky tape around them! Thirdly... I'm not a huge fan of their lippies. I have a few of the lighter colours but I did find them too sheer or a bit, eh. I'd rather pay slightly more and get something fantastic! I agree with you! They would probably save a bit of money too by not writing off the damaged stock... I haven't tried to many things by Essence as I hate digging through the crap stuff to find the unswatched/untested stuff..
the color looks like my lips but better sorta color! I honestly hate that bi*ches touching and opening every single lipstick, mascara or whatever, because in Europe there are no security seals on anything. We just have testers but sometimes they are missed too. It's ridiculous. Giant duck at Darling Harbour!